Michelle is an experienced Recruiter with demonstrated success in the staffing and recruiting industry. A strong human resource professional, she has a Bachelor’s focused in Business Management from Rider University. Michelle focuses on the Information Technology and Administrative Support divisions for placements that are full-time and temporary. The roles she works on span a wide range of industries such as legal, healthcare, financial, and insurance. 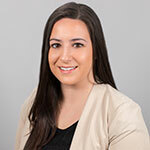 Throughout her 7 years as a Recruiter, Michelle has successfully completed hundreds of searches, helping professionals grow and advance in their careers. Michelle offers both clients and candidates exceptional professional service, confidentiality, and the most ethical values in executive search. She enjoys building long term relationships through her strong interpersonal and networking skills.